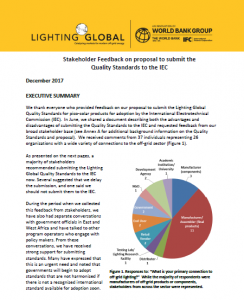 We thank everyone who provided feedback on our proposal to submit the Lighting Global Quality Standards for pico-solar products for adoption by the International Electrotechnical Commission (IEC). In June, we shared a document describing both the advantages and disadvantages of submitting the Quality Standards to the IEC and requested feedback from our broad stakeholder base (see Annex A for additional background information on the Quality Standards and proposal). We received comments from 37 individuals representing 26 organizations with a wide variety of connections to the off-grid sector (Figure 1). This document describes the feedback and the next steps we plan to take.